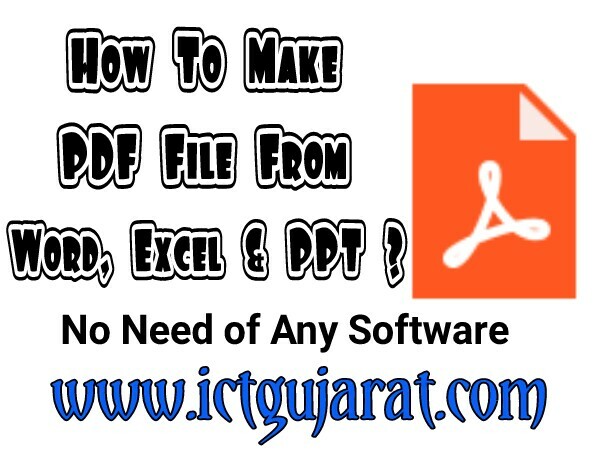 How To Make PDF File From Word, Excel & PPT ? HomeTIPSHow To Make PDF File From Word, Excel & PPT ? Namaskar, there are so many file formates for documents. The best file formate for every document is PDF. Full name of PDF is Portable document format. This type of file is very useful, small in size, no problem with fonts, support most of device which have PDF reader. How To Easily Edit PDF Files Online ? How To Search & Download PDF Books Online ? We use many softwares for creating PDF files in computer. Some softwares are very costly and others are not easy to use. Font problem is happened for local langagues. Here, I am suggested one official add-in for Microsoft Office. Using that add-in you can convert your word, excel & PPT file to PDF directly. You don't need any other software for that. 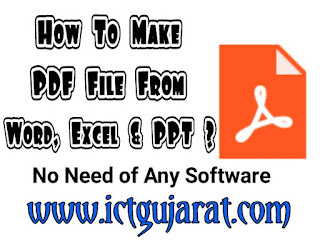 Download Microsoft Office Save As PDF add-in from below. Please note that this add-in is just support to MS Office 2007 or more version. It will not support in MS Office 2003. Click on download button to download the .exe file. How to Install Add-in in Microsoft Word ? Go to download folder of your computer. Find Save As PDF add-in .exe file. Double click on that file. Install box will open click on Next and I agree. At last click on finish. All done!! Your plug in installed now. How to Make PDF file Using this Add-in ? Open any MS office word, excel or PPT file. Set-up the page. This is specially for excel files. Set pages from print preview. Now click on Menu button on the top of MS Office file or we called File menu. Go to 'Save As' option. Select PDF. This option will appear after adding the add-in for MS office. Select place for saving your PDF file and click on save. So you will make your file as PDF from word, excel or PPT. Hope you like this article for creating PDF files using computer easily. We will come with how to create PDF files in mobile in next post. So, stay connected with us. Like us on Facebook & join our telegram channel by clicking on below link.